Cataract is a clouding of the original lens of the eye. It is a problem that becomes more common as a person becomes older. In some studies, >90% of people over 70 years old have some degree of cataract. 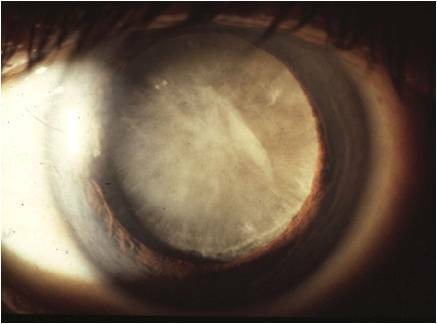 Cataracts can develop earlier in some people if they smoke, have diabetes, or have very high degrees of shortsightedness (greater than 1000 degrees). Cataracts usually slowly become denser with time, and there is no medicine or eyedrop which can cure it. Fortunately, cataract surgery is now very advanced and refined. It is day case surgery which usually takes 30 minutes or less to complete. During surgery, the cloudy lens (cataract) is removed and a new, perfectly clear lens implant is inserted into the eye. It used to be said a long time ago that a cataract must be ‘mature’ or ‘ripe’ (right) before it could be operated on. Nowadays, that is not true. A cataract can be operated once it affects a patient’s vision such that they have difficulties in their daily life. As such, a pilot or someone who drives may be affected even when the cataract is fairly mild, or on the other hand a sedentary person with no specific visual requirements could tolerate a denser cataract. Once the cataract affects a patient’s vision and daily life, and the vision cannot be improved with glasses, surgery can be considered. Due to advances in cataract surgery, vision can be very sharp after the operation and any existing spectacle power (long or shortsightedness, or astigmatism) can be reduced to allow for good distance vision without glasses. The spectacle power after surgery is in fact customizable, so if a patient desires good reading vision without glasses, he or she could also be intentionally left mildly shortsighted. Multifocal lens implants do in fact exist and can provide good distance as well as near vision in the operated eye. However, by splitting the light into 2 focus distances, they reduce contrast as compared to normal monofocal lenses and also give rise to halos and other visual disturbances especially in the dark. These visual disturbances are permanent and cannot be corrected with glasses. As such, many patients who want to reduce their dependence on reading glasses after cataract surgery would do better with monovision using normal monofocal lenses. Monovision involves using lenses that make one eye focus for distance, and the other mildly shortsighted to focus for near. In this way, the 2 eyes working together enable good distance as well as near vision. Patients with monovision still occasionally need glasses, such as when driving at night or when reading fine print for long periods of time. However, they do not experience the reduced contrast or halos that patients with multifocal lenses experience. Is there such a thing as ‘laser cataract surgery’? For many years now, cataract surgery has been performed using ultrasound to break up the cataract, so that it could be removed through a very small incision of 2-3mm. This is the current gold standard. 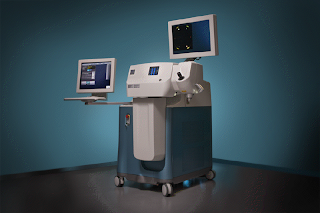 In the last few years, a special laser called a femtosecond laser (above) has been created to perform a few steps of the cataract surgery. It is not possible to do the entire surgery with this laser, and it only helps the surgeon to perform several parts of the surgery. At this time, using the laser requires more time than standard surgery, costs more, may cause extra bruising around the eye, and has not been shown to have any better outcomes than the standard method of phacoemulsification using ultrasound. We have not found this laser to be useful although advances in technology in the future may change this. Thanks for providing brief information about cataract surgery. Thia will help us a lot.